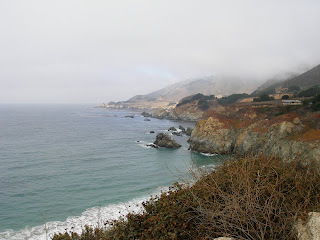 Big Sur is on the Central Coast located south of the Monterey Peninsula on Highway 1. 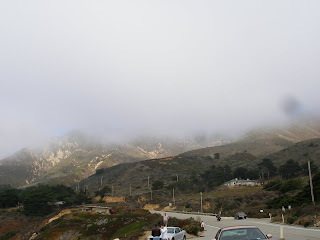 The first time I tried to go to Big Sur, the drive was completely enshrouded in fog and nothing could be seen on either side of the road. 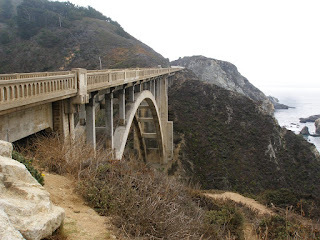 Since the fog didn't seem to be lifting at all, we turned around at the Bixby Bridge. I'm glad that we made it back for a second attempt at Big Sur. There was some fog this time, but nothing like there was before...you could see the beautiful scenery located on both sides of the highway. The fog was mostly located off the coast hiding most of the ocean from view and there was some in the hills, but what I could see was quite impressive! I had no idea that the mountains were so close to the ocean. The Santa Lucia Mountains rise high on the inland side of the road, while the ocean side of the road is nothing but steep cliffs in many places. This makes for a somewhat harrowing, yet magnificent drive. i stole a few of your Big Sur pictures for my computer wallpaper. certainly not as scenic as the ohio river but its pretty close.